NEW YORK -- Lamar Jackson was trying to remember the last time he cried. He was pretty sure it involved losing a little league football game. On Saturday night, Louisville’s spectacular sophomore quarterback found out winning can get a guy choked up, too. 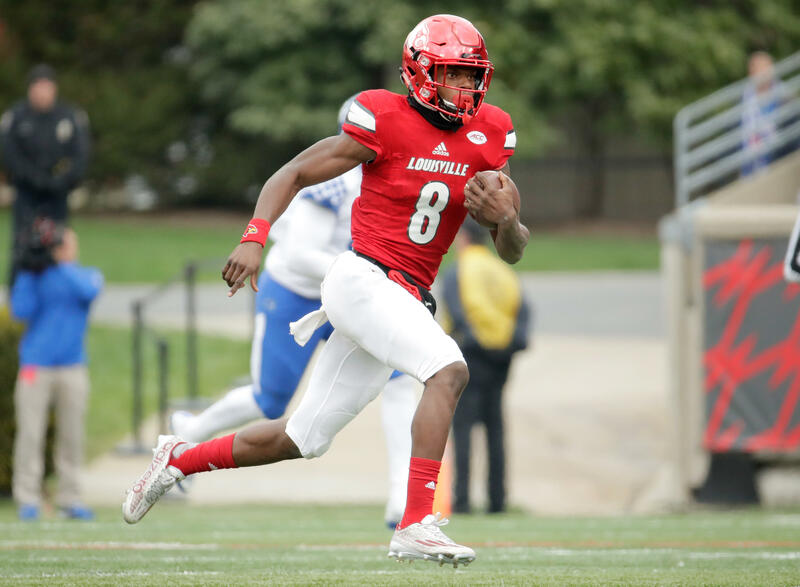 Jackson became the first Louisville player to win the Heisman Trophy, beating out preseason favorite Deshaun Watson of Clemson despite some late-season struggles. Jackson beat out Clemson QB Deshaun Watson, Michigan linebacker Jabrill Peppers and Oklahoma’s duo of QB Baker Mayfield and wide receiver Dede Westbrook for the award, making him the 14th signal caller to win the award in the last 17 years, CBS Sports reports. Jackson, wearing a red velvet blazer with shiny black lapels and a black bow tie, said he could feel his heart pounding in his chest right before his name was announced. He barely held it together while giving his acceptance speech, with the former Heisman winners standing behind him on stage. Early in the season, Jackson leapt over a loaded field of Heisman contenders that included five of the top seven vote-getters from 2015 to become the front-runner. By the time he slowed down nobody could catch him. Jackson accounted for 51 touchdowns and averaged 410 yards per game in total offense in his first season as Louisville’s full-time starter. “He surpassed everything I thought he could do,” Louisville coach Bobby Petrino said. Jackson ultimately won the Heisman going away, with 2,144 points to Watson’s 1,524. By percentage of possible points received, Jackson’s victory was the seventh largest in Heisman history. He also became the youngest winner at 19 years, 337 days, a few days younger than 2013 winner Jameis Winston of Florida State. “Everything I do is for my mother,” Jackson said. Jackson is the first Heisman winner to play on a team that lost its last two games of the regular season since Tim Brown of Notre Dame in 1987. He’s the first to enter the postseason without a chance to win the national title since Johnny Manziel of Texas A&M in 2012. No matter. Jackson did so much before November it was difficult to deny him the award because of a couple of missteps at the end . He provided a signature moment against Syracuse , hurdling a defender on his way into the end zone, and then played his best against Louisville’s toughest competition. In a romp over Florida State and a close loss at Clemson , Jackson threw for 511 yards, ran for 308 and accounted for eight touchdowns. After ripping apart Florida State in September, he earned the stamp of approval from his idol, former Virginia Tech and NFL star Mike Vick. Watson made the biggest surge, but fell way short. Jackson continues a recent trend of breakout stars winning the Heisman. He is the sixth player to win the award as either a redshirt freshman or sophomore, all since 2007, joining Manziel (redshirt freshman), Winston (redshirt freshman), Mark Ingram (sophomore), Sam Bradford (sophomore) and Tim Tebow (sophomore). Jackson came to Louisville as a three-star recruit from Boynton Beach High School in Florida. Some colleges were not sold on him as a quarterback, but Jackson was such a dynamic talent that Petrino altered his offense to accommodate Jackson’s speed and elusiveness. Jackson flashed brilliance as a freshman, but with so many well-established stars from Watson and Mayfield to running backs Christian McCaffrey of Stanford, Dalvin Cook of Florida State and Leonard Fournette of LSU, he entered this season with little fanfare. Jackson spent the season adjusting to newfound fame, growing into the role of face of the team and trying to stay out of the spotlight. He said he cut down on trips to the mall to avoid the inevitable crowds he drew. He is about to become even more popular. Especially, back in Louisville, where he has another year before he can even consider his next big jump - to the NFL. Louisville athletic director Tom Jurich said he liked the idea of building a statue of Jackson in front of Papa John’s Cardinal Stadium. Jackson led the voting with 2,144 points, more than 600 points ahead of Watson in second place. Jackson’s margin of victory is the sixth largest of all-time.